This is a photo of a White Peacock Butterfly (anartia jatrophae) taken with a Nikon D80 and Nikkor 60mm lens attached to a Tamron 2x Teleconverter. This photograph was taken in the Florida Everglades in an area just off I-75 (Alligator Alley) in Broward County. White peacock butterflies are commonly found in warm, open, weedy areas such as fields or parks where water is abundant -usually in the form of a pond or stream. Adult butterflies are often seen along roadside ditches where host plants are abundant. (2.01 to 2.76 in; avg. 2.38 in)The eggs of this species are small and green and found on the underside of host plant (Bacopa monniera) leaves. Caterpillars are black with silver or white dots and branched spines. The chrysalis is light green with small black dots. 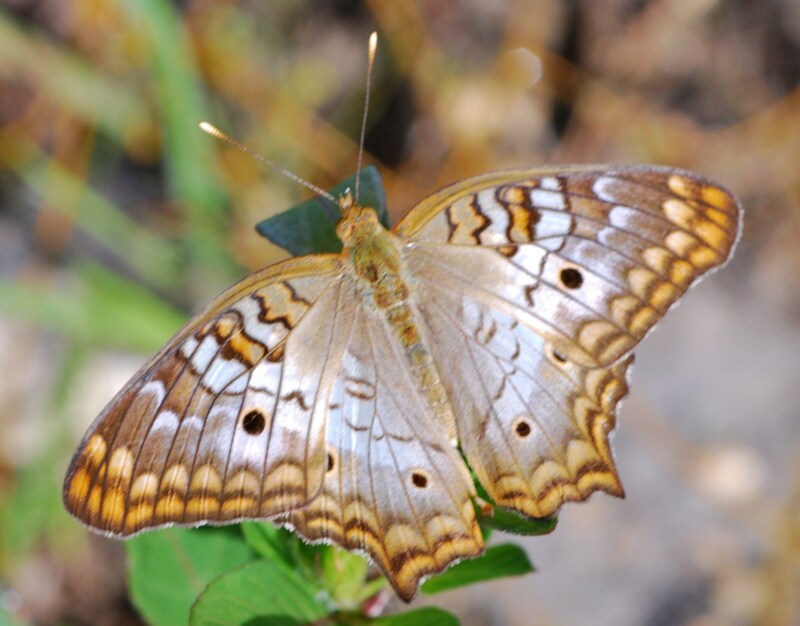 The upper side of the adult butterfly is white and contains a round black spot with a light-to-dark brown crescent-shaped trim on forewing. The hindwing has two spots similar to those on the forewing and is trimmed with the same crescent trim in brown to orange. The two front legs are non-functioning, giving the appearance of only four legs- characteristic of all members of the Nymphalidae family. In dry or winter seasons, the White Peacock becomes paler and larger. Thank you Adrian, the Everglades offers some amazing subject material. I’m very impressed by your shots! How do you find these subjects? Alan, do you take people out for photo trips?? I\’m totally jealous of your work! Looks like a moth! Do you get any Emperor Moths? Very inspirational photos! Thanx Laurel. I’ve never seen an Emperor moth in Florida but then again, who knows! Great picture – all these exciting new species I probably will never see in the wild. Love this one. We captured a large tortoiseshell this year – very rare in the UK. Thank you Lin. You would be amazed how much life there is just in your neighborhood. Pretty! Looks like a moth.